Some great little tools from the SMART Lesson Activity Toolkit (2.0) to use in your lessons – suitable for all curriculum areas! To find them simply click on the gallery tab in SMART notebook, select Lesson Activity Toolkit and then in the search box type what you are looking for i.e. “Random Word Chooser”; “Random Group Chooser” or “Spinner”. Let me know if you have any problems. Please also let me knows of any particular ways these have been useful in the classroom so we can share the ideas with others. I’m sure you can all think of lots of uses for this little tool, but a few ideas to get you started……. let me know of any other ways you think of and we can share them on here. Key word terminology – Revision activity – input a set of key terms related to a particular area – randomly select one and ask students to define the key term. Maths starter – you can type in numbers (thus equations or sums) and not just words – could get computer to select 5 at random as a little starter? MFL – key words in the target language for a particular topic area – randomly selected and students have to give the translation. A great little tool for any activity in any subject involving group work and for which you want to randomly mix students. (ii) Click generate…. and hey presto…! A simple spinning tool – you can add text or simply have colour coded segments. To edit click on the arrows on the right of the spinner and you will get the selection box below. To type a word into each segment, make sure you keep clicking on the relevant segment or it will simply save over the one you have just named. Again I’m sure you can come up with lots of ideas for use – just drop me an email so I can add to the list! 3. Revision – simillar to above but student selects a key term / case study using topic and then has to tell the rest of the class as much as they know about it, or describe the key term etc. 4. Again numbers can be inputed as well as text – enabling maths equation style questions. SMART Notebook Tip – Setting a default font. Got a favourite font and size that you like to use in your presentations? Fed up with having to keep change the font and size to your favourite every time? 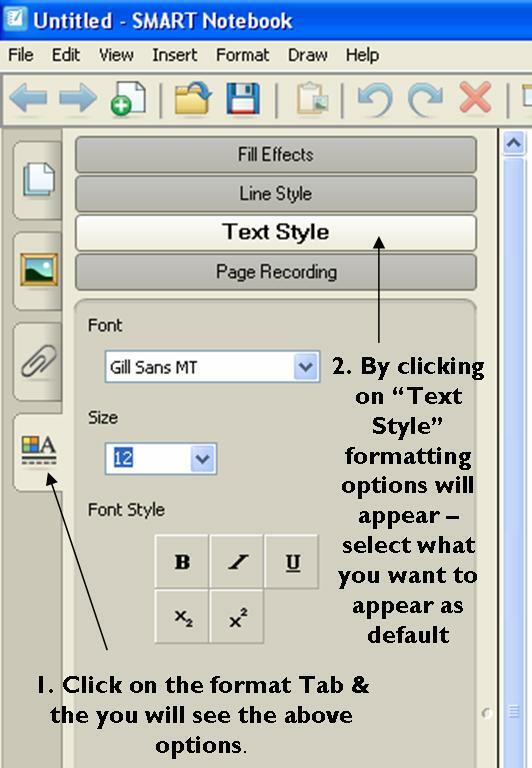 I know that a number of people would like to be able to set a default text style and font in notebook so that you don’t have to keep reformatting every time you type and if that is you, here is the answer! Instructions for setting a default font and size in SMART notebook. 4. Make your selection from the options given for the text and size that you want to appear as default and then click save properties in the bottom left hand corner.